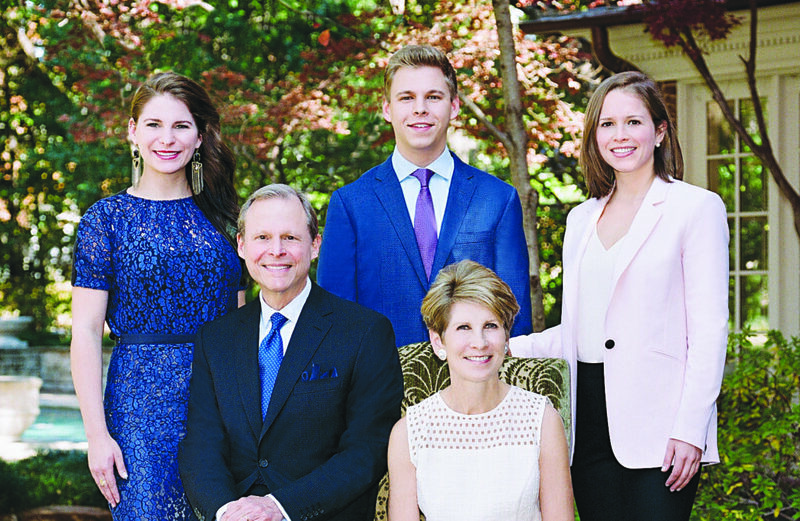 Laura Miller with her husband Steve Wolens and children, from left, Lily, Max and Alex. Whether as mayor, councilwoman or investigative reporter, Laura Miller has never shied away from taking on Dallas City Hall. Now, the two-time breast cancer survivor and Dallas’ third female Jewish mayor is the first former mayor to run for Dallas City Council. That’s at least according to the city employee who accepted her paperwork for City Council District 13 two hours before last month’s filing deadline. At the least, she’s running for office again after 12 years in private life, spending time with her husband, former State Rep. Steve Wolens, a Democrat, and watching her three children grow up. She enjoyed private life so much she first asked potential challengers. “The last thing I thought I’d do is run,” she said. She really wishes she had more time. “Ideally you would get five to six months to run a campaign. But instead we get nine weeks,” she said. The district stretches from Central and Hillcrest, dips into Lemmon and includes Vickery Meadows. “It’s a varied district,” she said. “Unlike running for mayor,” which includes campaigning on major issues such as pension reform to bread and butter issues like potholes, “running for council gives you a different perspective,” she said. She bought a house in the district after she was elected to the city’s top post in 2002. She then moved to the district in 2004, citing a long commute for her children to get to school, much less from Oak Cliff to City Hall. Even after she left office, her council members shared her cautious approach to encroaching development. “The council members were homeowner-centric,” she said. Many of those predecessors have endorsed her, including three of Gates’ predecessors Mitchell Rasansky, Donna Blumer and Sid Stahl. One case in particular involves dense development just south of Preston Center. Single-family homeowners are pushing back since St. Michael & All Angel Church on Douglas Avenue entered a joint venture agreement with Lincoln Property Company to build hi-rise apartments and an office tower on vacant land next to the church. Opponents drafted a petition and made yard signs demanding “No More Towers in Preston Center.” They are calling instead for focus on easing traffic congestion. Miller’s opposition is not to density or development alone but irresponsible development — that is, new development without regard to infrastructure needs, walkability, design, green space, street and side yard setbacks and landscaping. Her campaign treasurer Doug Deason, president of Deason Capital Services, agreed. “The developers have had the upper hand in District 13 for the past six years, and homeowners and small businesses are tired of City Hall ignoring their pleas for help,” he said. Gates defended her record when asked about Miller’s issues. But Miller said the potential multistory buildings around Preston Center were not her only issue. Her other issues for running call to mind her other mayoral priorities: addressing crime, homelessness and the morale of police and fire. Homelessness is a personal issue. She participates in The Ladder Project through her synagogue Shearith Israel. The concept is simple: 1,000 families help a homeless person achieve self-sufficiency financially and socially. Working with The Bridge, a homeless center in downtown Dallas, they successfully helped a 58-year-old man move into his own apartment. They are now preparing to work with a second, yet-to-be-identified individual. For Miller, the project may just help one person at a time. “But we can’t do nothing,” she said. “My heart is with this project,” as much as her eyes are back on City Hall.